Attribute reduction with rough sets is an effective technique for obtaining a compact and informative attribute set from a given dataset. However, traditional algorithms have no explicit provision for handling dynamic datasets where data present themselves in successive samples. Incremental algorithms for attribute reduction with rough sets have been recently introduced to handle dynamic datasets with large samples, though they have high complexity in time and space. To address the time/space complexity issue of the algorithms, this paper presents a novel incremental algorithm for attribute reduction with rough sets based on the adoption of an active sample selection process and an insight into the attribute reduction process. This algorithm first decides whether each incoming sample is useful with respect to the current dataset by the active sample selection process. A useless sample is discarded while a useful sample is selected to update a reduct. At the arrival of a useful sample, the attribute reduction process is then employed to guide how to add and/or delete attributes in the current reduct. The two processes thus constitute the theoretical framework of our algorithm. The proposed algorithm is finally experimentally shown to be efficient in time and space. This is a manuscript of the publication Yang, Yanyan, Degang Chen, and Hui Wang. 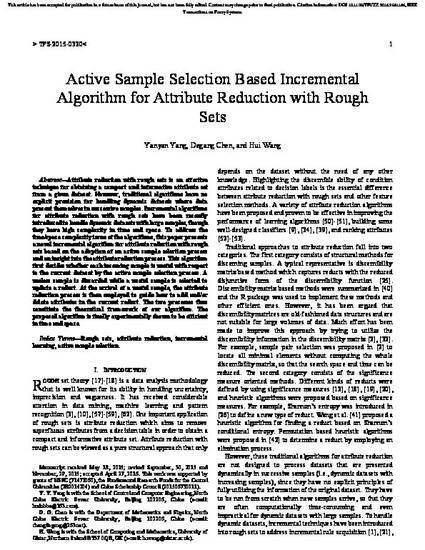 "Active Sample Selection Based Incremental Algorithm for Attribute Reduction With Rough Sets." IEEE Transactions on Fuzzy Systems 25, no. 4 (2017): 825-838. DOI: 10.1109/TFUZZ.2016.2581186. Posted with permission.